There Goes My Hero–No, MINE! Sound familiar? Of course it does. Aside from the fact that IT IS MY LIFE right now. Ok, it’s my life all the time. It also WAS my life growing up. What, that’s impossible, you say. Nick, I’m sure you and your siblings got along famously and shared toys like little angels… To which I reply: Have you met the Browne siblings??? Perhaps you haven’t. But, many times, it was like Mad Max in our basement. You give me that toy RIGHT NOW OR ELSE. Tiny kid rumbles ensue. Really pleasant memories here, you guys. Need more examples? Of course you do. I don’t recall the year. But, I was a kid. It was Christmas Day. In our family, for a long time, we didn’t unwrap presents. They were laid out in individual piles, unwrapped. So, as soon as we would come down the stairs and turn towards the living room, we would see just what presents we had received. One year, a toy that I REALLY wanted and asked for specifically was in my brother’s pile of gifts. And I threw a fit. Why? Because it was on my list. Duh. It was MY toy. I asked for it. I wanted it. It should have been for me, right? Talk about ungrateful… I deserved a worse punishment than I received. That’s the honest to goodness truth. I shouldn’t have thrown a fit, I knew eventually my brother would share with me. And he did. Like, that day. Lesson learned (for a day). Fast-forward to today where I’m the parent. Sophia and Maddie are at the ages where they both like the same toys, but Maddie isn’t quite up-to-speed with how to handle all the toys that Sophia plays with. But, she still wants to play with them anyway. So, they fight over them. Tears. Screams. SO MANY TEARS. And, something that can give Maddie the experience of playing with toys that may not be in her age-range but she can still get enjoyment out of. Plus, if we get them the same toys, that kinda sorta maybe saves us some money. So, that’s a win, too, right? Right. Quite honestly, that is one of the reasons that we loved the PLAYSKOOL HEROES product line. For Sophia, it lets her play with toys that are meant for her age, while also letting her play with some characters that she’s just starting to understand. Like Iron Man and Transformers Rescue Bots. 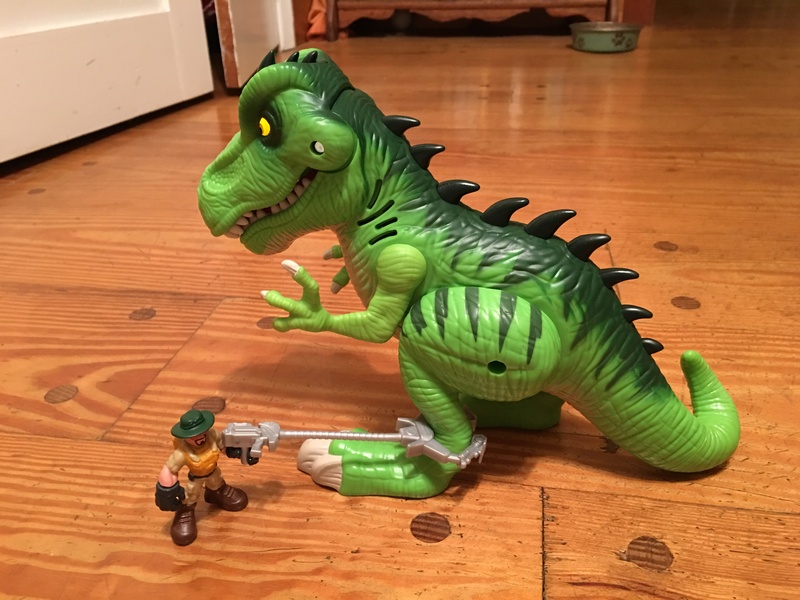 Plus, who doesn’t love the Tyrannosaurus Rex from Jurassic World? For Maddie, who has no idea who these characters are, it just gives her the chance to scream “RAWRRRRR!! 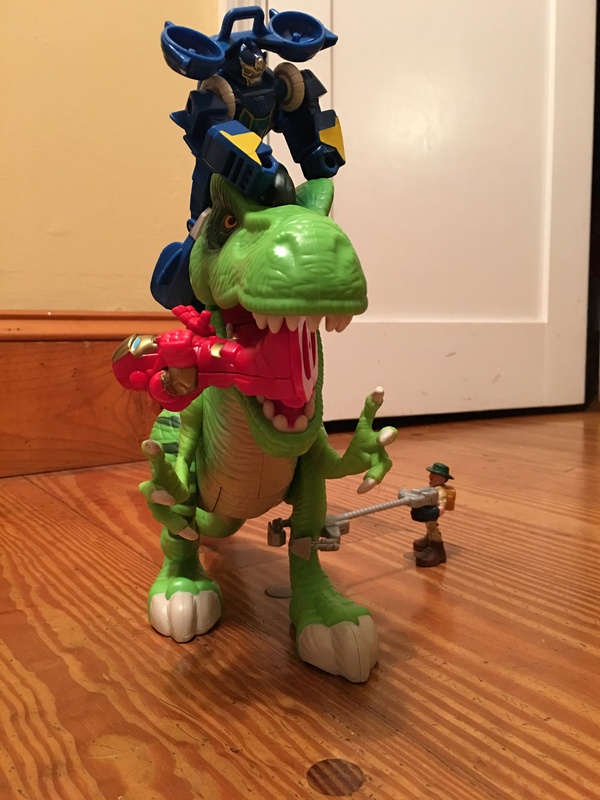 !” and have the T-Rex eat Iron man because, well, reasons. It’s just good fun for both of them. Check out more on the totally and awesomely fun line below. 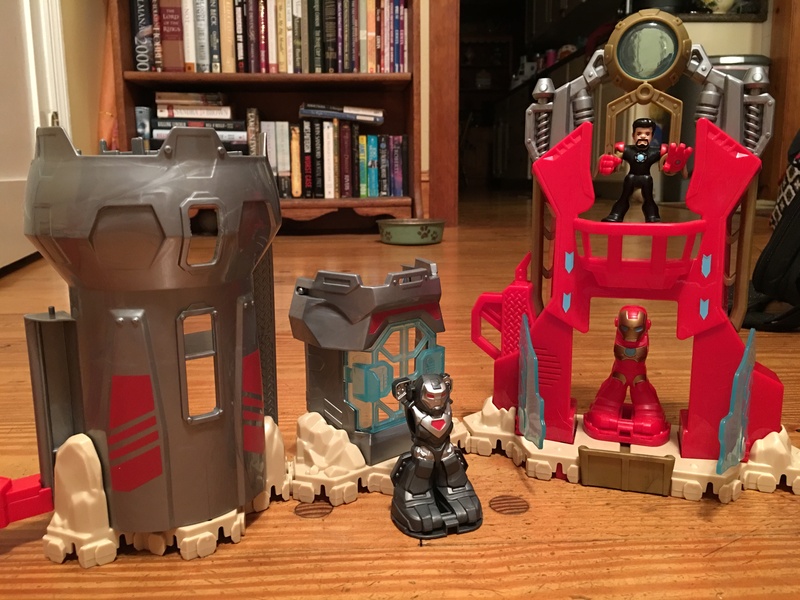 Geared for kids ages 3-7, this set lets kids unleash their inner-Tony Stark. They can re-enact favorite movie scenes or create their own! 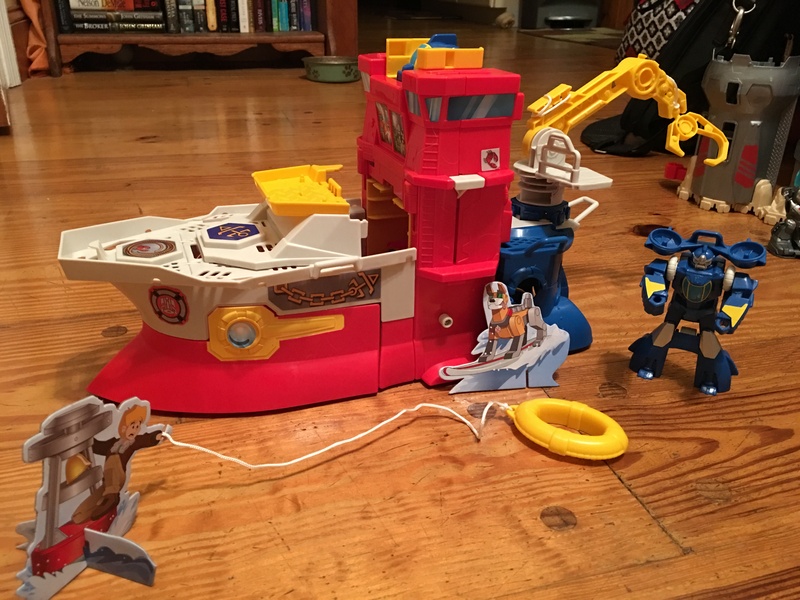 Geared towards kids ages 3-7, this set was inspired by the hit animated TV series TRANSFORMERS RESCUE BOTS. This set is definitely more than meets the eye. Geared towards kids ages 3 and up, the Jurassic World playset lets little hands get a handle on big-kid toys. Complete with a T-Rex that growls and gobbles with sweet light-up eyes and head-chomping action, kids can unleash their inner beast.